Halloween time, a season for fun-loving spirits of all ages, adds spooky excitement to the Disneyland Resort from Sept. 9 through Oct. 31. Special Halloween-themed attractions–Haunted Mansion Holiday and Space Mountain Ghost Galaxy–return to Disneyland Park, while the haunts who reside year-round at The Twilight Zone™ Tower of Terror invite guests to “drop in” at Disney California Adventure Park. Currently at the Disneyland Resort, guests continue to enjoy the 60th Anniversary Diamond Celebration, with sparkling décor in Disneyland and Disney California Adventure, plus a dazzling array of after-dark shows, all of which are presented nightly through Labor Day, September 5. As the summer season turns to fall, Mickey’s Halloween Party will begin Friday, Sept. 23, for 17 select nights. The after-hours party treats guests to unforgettable entertainment including the sensational “Halloween Screams” fireworks spectacular, a guest favorite that is exclusive to Mickey’s Halloween Party. Adults and children are encouraged to dress in costume for the party as they trick-or-treat throughout Disneyland for a scary good time. Guests may check http://www.Disneyland.com for Mickey’s Halloween Party costume policy guidelines prior to their arrival. Tickets for Mickey’s Halloween Party* go on sale for Disneyland Resort Annual Passholders, Disney Vacation Club members and Disney Visa card holders on Thursday, July 21. General public ticket sales begin Thursday, July 28. New for Mickey’s Halloween Party in 2016, The Headless Horseman of Sleepy Hollow rides his ghostly black steed and carries his flickering jack-o-lantern through the heart of Disneyland, heralding the arrival of Mickey’s Halloween Party character cavalcade, presented on the 17 nights of this special party. Entry to Disneyland Park before the party is included with a Mickey’s Halloween Party ticket. Guests have the opportunity to play in Disneyland park for three hours before the party starts, and then go trick or treating – for candy and healthy treats – in the ultimate Disney neighborhood. The “Halloween Screams” fireworks spectacular, presented exclusively for guests of Mickey’s Halloween Party, is hosted by “Master of Scare-omonies” Jack Skellington. Party guests will rock out at Tomorrowland Terrace in a family-friendly dance party. Guests can “Party Like a Villain” as Disney villains appear in select locations for photos and character greetings. Mickey Mouse and his pals will appear as well, dressed in their Halloween costumes. Enhancing the eerie atmosphere along Main Street, U.S.A., animated Halloween images – ghosts, bats, pumpkins and skeletons – appear and disappear mysteriously on the facades of buildings throughout the evening. The ghoulish Cadaver Dans quartet performs Halloween tunes aboard a drifting graveyard-themed raft, on the fog-filled Rivers of America in New Orleans Square and Frontierland. Nearly all the favorite Disneyland rides and attractions, plus Haunted Mansion Holiday and Space Mountain Ghost Galaxy, will be open to party guests. On select, non-Mickey’s Halloween Party nights, guests visiting Disneyland will enjoy a special treat: the “Fantasy in the Sky” fireworks spectacular. In addition, the dynamic “Mickey’s Soundsational Parade” will march down Main Street, U.S.A., each day throughout Halloween Time at the Disneyland Resort. Guests in search of Halloween chills may “drop in” to visit the ghostly full-time residents of The Twilight Zone™ Tower of Terror in Disney California Adventure. Here, in the remains of the Hollywood Tower Hotel, dwell the spirits of hotel guests who disappeared during a “supernatural” event on Halloween Night in 1939. With the arrival of Halloween time, Jack Skellington makes his annual appearance in Disneyland to take over the Haunted Mansion and bring Haunted Mansion Holiday back to New Orleans Square. Haunted Mansion Holiday is inspired by the classic animated film “Tim Burton’s Nightmare Before Christmas” and transforms the Mansion with a collision of Halloween spookiness and Christmas cheer. Oct. 3, 2016 marks the 15th anniversary of this special attraction’s premiere in Disneyland. Spooky Space Mountain Ghost Galaxy in Tomorrowland draws guests back again and again during the Halloween season. The unique Halloween-themed experience launches voyagers into a haunted section of the universe, where ghosts appear out of the starry darkness and swirling galaxies of Space Mountain, reaching out as if to grab guests as they speed through space. The exhilarating drops and curves are punctuated by piercing screams, creepy sound effects and haunting music. In Frontierland, the traditional Dia de los Muertos is observed through Tuesday, Nov. 1, with a holiday skeleton display in the plaza near the entrance of Rancho del Zocalo. Tickets for Mickey’s Halloween Party* may be purchased online and on mobile devices at Disneyland.com/party, as well as at the Disneyland Resort main gate and by phone at 714-781-4400. Guests may check for availability for the 17 nights: Friday, Sept. 23; Monday, Sept. 26, Wednesday, Sept. 28; Friday, Sept. 30; Monday, Oct. 3; Wednesday, Oct. 5; Friday, Oct. 7; Monday, Oct. 10; Wednesday, Oct. 12; Friday, Oct. 14; Monday, Oct. 17; Wednesday, Oct. 19; Friday, Oct. 21; Monday, Oct. 24; Wednesday, Oct. 26; Saturday, Oct. 29; and Monday, Oct. 31, Halloween night. Online and mobile purchases are not available the day of the event. Parking is not included in the ticket price, and parking fees will apply. Tickets purchased in advance are available at a discount on select nights. Tickets purchased on the day of the event are $89 each. All tickets to Mickey’s Halloween Party on Saturday, Oct. 29, and Monday, Oct. 31, are $99 each. Mickey’s Halloween Party is a non-smoking event. Smoking will be permitted only in the Esplanade outside the Disneyland main entrance. 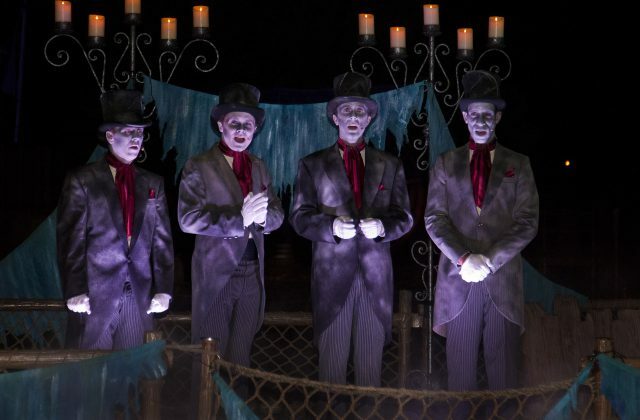 For more information about Halloween Time at the Disneyland Resort, see http://www.Disneyland.com/Halloween. Entertainment and attractions are subject to change without notice. Guests may visit the site for additional details.